Okay, so bear with me. In this ratio, I want the first value to be high and the second value to be low. For example, climbing Baker Mountain? Kids mostly had fun + Learned About Nature + Exercised Like Crazy : Completely free + Birds Tweeting Serenely in Splendid Fresh Air + No opportunities to purchase anything or view any advertisements . . . A super-success! By this measure, the following outings failed. 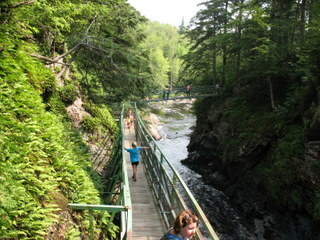 We visited High Falls Gorge. Oh, yes, the waterfalls were gorgeous. But I see water rushing over rocks and want to go wading. I’m not saying that I’m going to, you know, jump into a barrel and throw myself into the rapids, but I’d like to touch a little water. This wasn’t possible at High Falls: there was no direct contact with the water, unless you count the panning for gemstones activity (sold separately). With walkways, stars, and small overlook spaces, it was a bit stressful to keep the kids properly corralled and ensure that they weren’t crowding other people, like the Incredibly Slow-Walking Woman or the Man of a Thousand Pictures. And yes, my expectations were raised when I realized that it was $13.50/adult, $9.50/kid. Somehow we’d managed to miss that when we were pondering the visit. Also? A ginormous gift shop. Which, you know, I’m pro-souvenir. But not when I’ve just dropped over forty bucks for the opportunity to walk through what feels like a massive hamster tunnel maze. Then it just makes me bitter. It wasn’t, you know, awful. 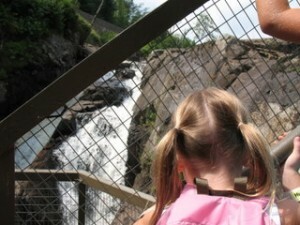 There was a nature trail that the kids enjoyed as well as picnic tables for a lunch break. And it was beautiful. If it had cost $5/person I would have recommended it, and if it were free, I would have raved about it. But, as you’ve probably learned by now, I’m cheap. After the waterfalls and a picnic lunch, we headed over to Avalanche Adventures for some oft-requested mini-golf. This recreational emporium happened to be directly across the street from another mini-golf place, Pirate’s Cove. Honestly, both places looked to be a child’s dream come true and a parent’s nightmare, so we basically chose Avalanche because it was easier to make a right turn than a left turn. As it turns out, it was cheaper, too: Avalanche cost $5/kid, $6/adult for a game of mini-golf while across the street, it was $7.50/person. Actually, it was pretty good. The truth? 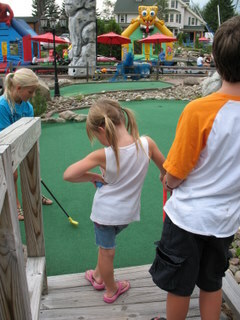 I was not enthusiastic about facing a game of mini-golf in the heat with overtired and potentially fretful children. But it was painless. One of the kids in our group opted for the bouncy village, and it was close enough that you could almost supervise both sets of children without going crazy. We didn’t do any rock climbing or bungy jumping, and I wasn’t even aware of the caving possibility until I came home and looked at the website, but I think that this could be a good destination, especially if you had a large group of people of varying ages. M putts as J waits with style. Bounce houses in the background. Some portions of the golf course had seen better days, but overall it was fun and entertaining for everyone. Alas, anything with a larger-than-life inflatable Sponge Bob scores poorly on the Parental Migraine/Consumerist Crap scale. I think that either of these outings on its own would have been fine, but coupling them in one day led to sensory/wallet overload. I was glad to get back to backyard kayaks! 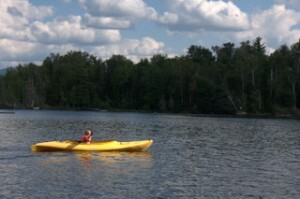 M kayaking. She loved it.